During the 18th century, auctioneers were responsible for selling a wide variety of belongings, from furnishings and furniture to animals and property. 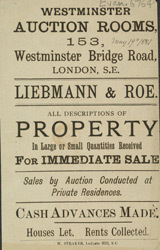 In the early 19th century many auction rooms were established in rural areas and these began to sell land and property exclusively. By the middle of the century, this was perhaps the most popular way to buy houses or country estates.